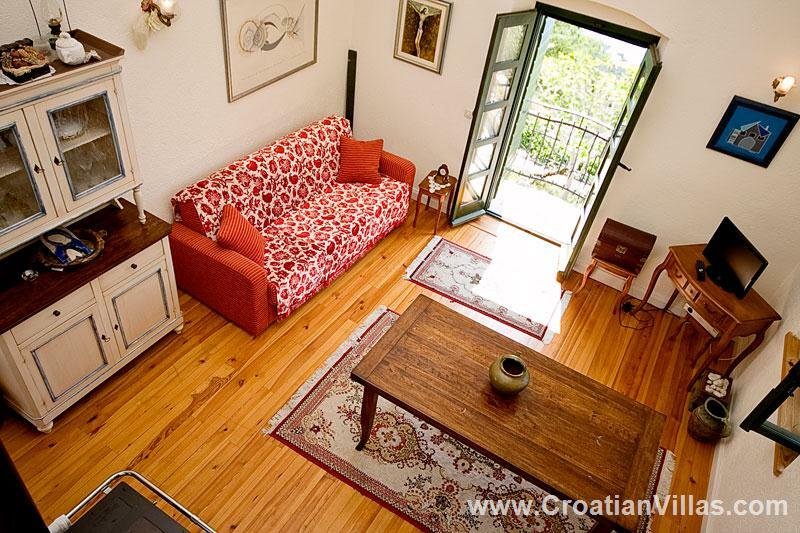 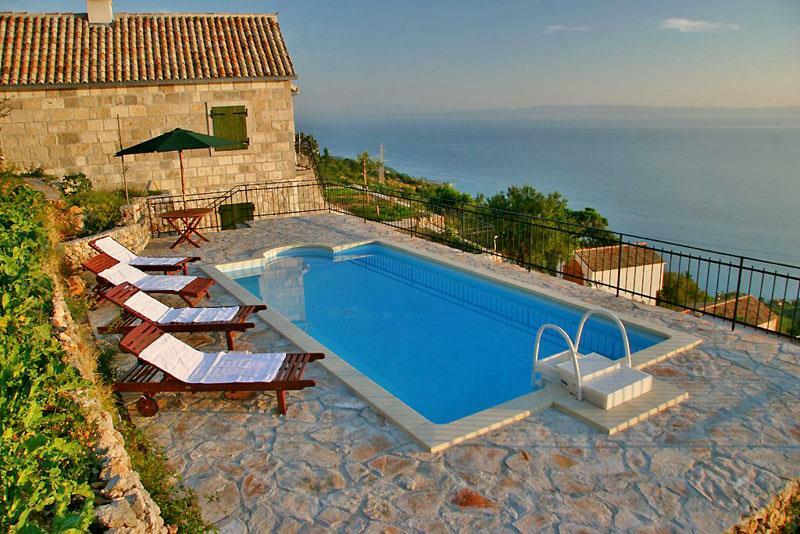 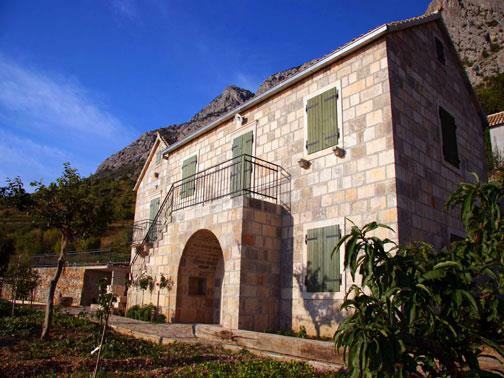 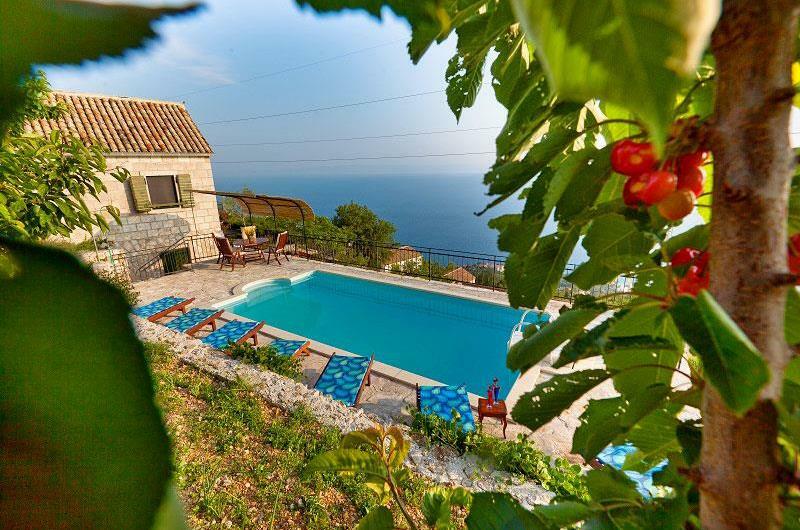 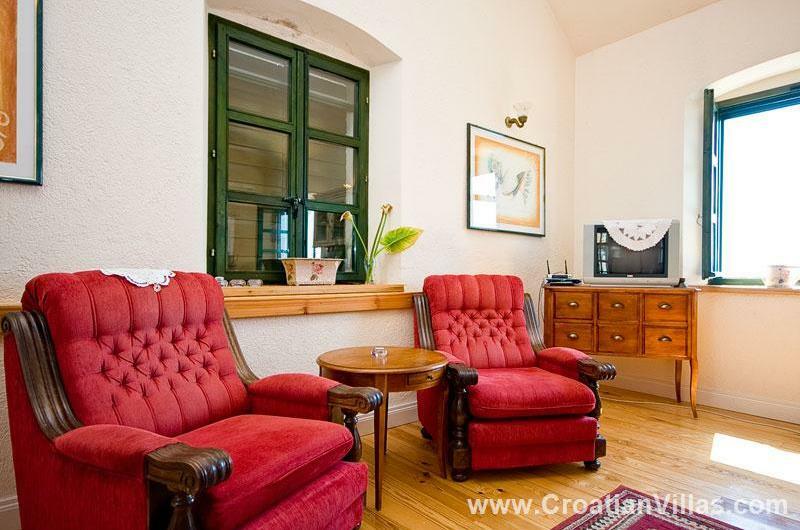 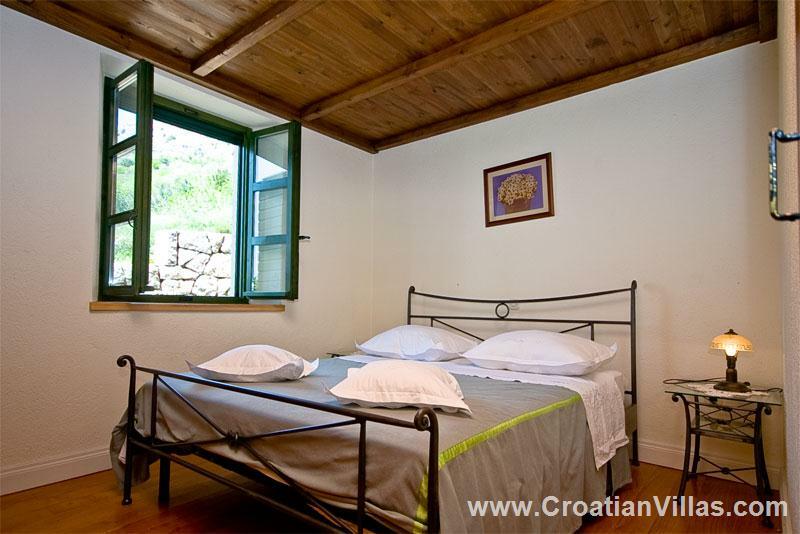 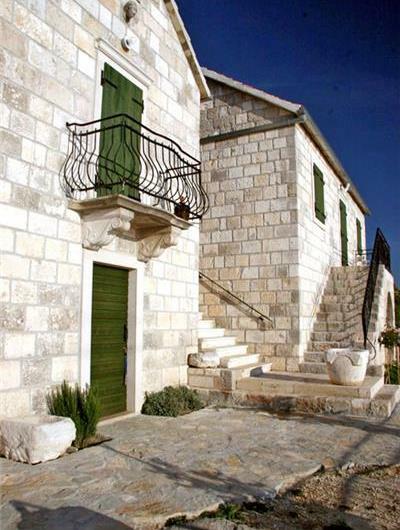 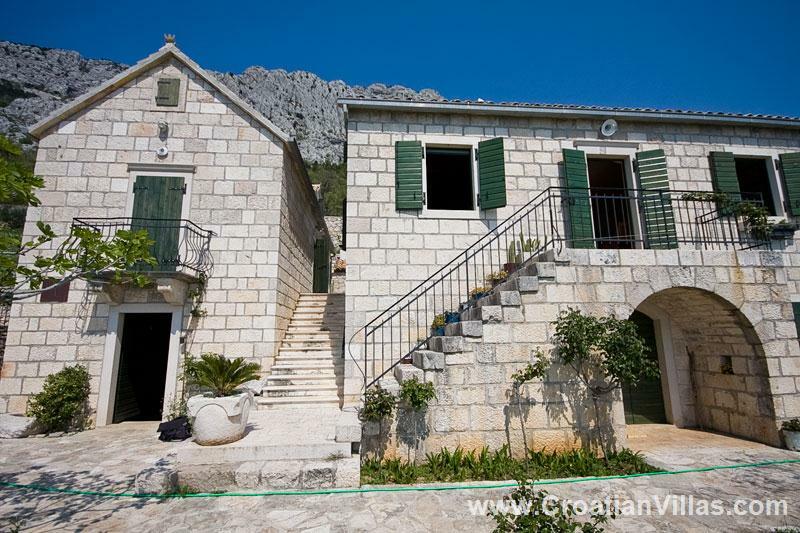 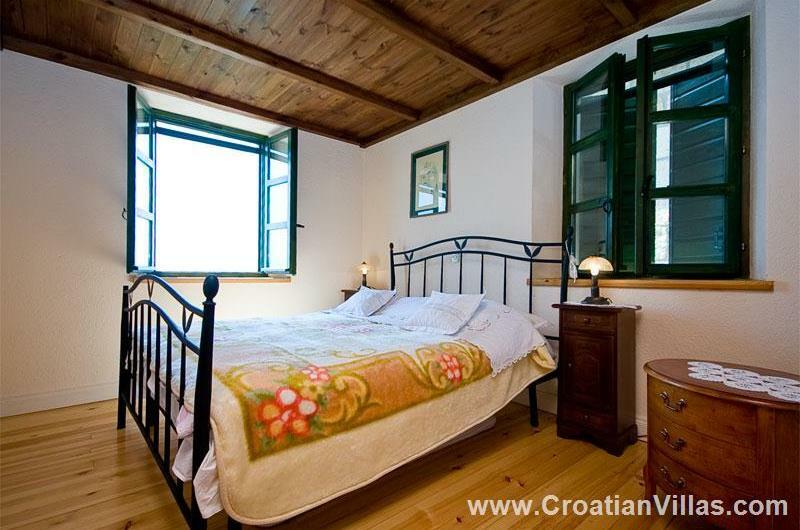 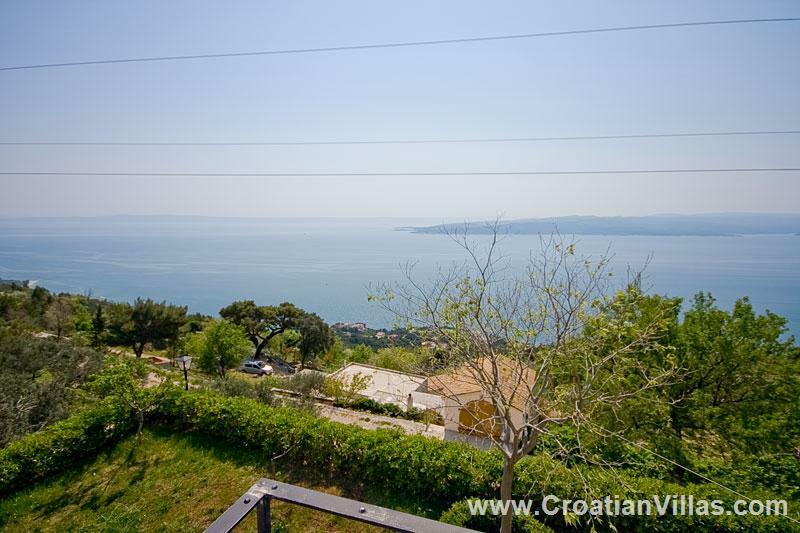 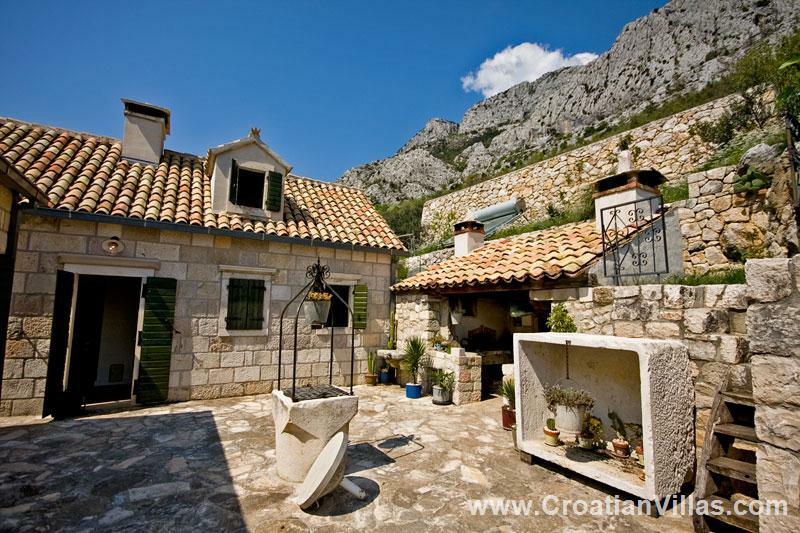 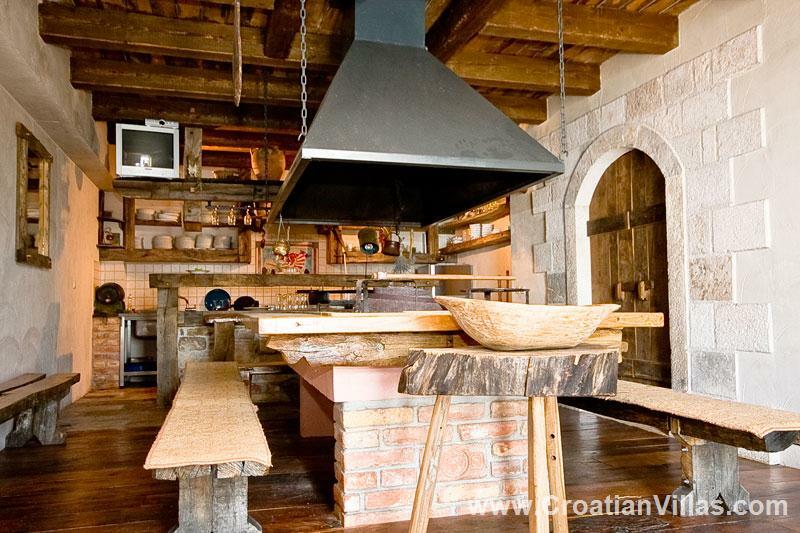 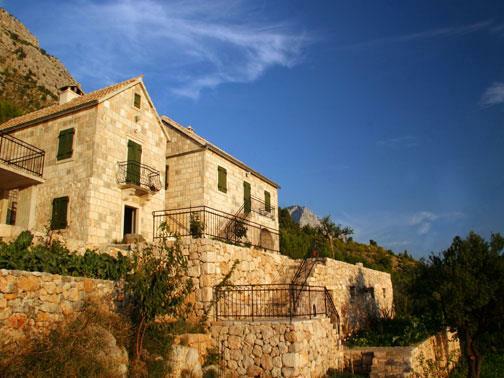 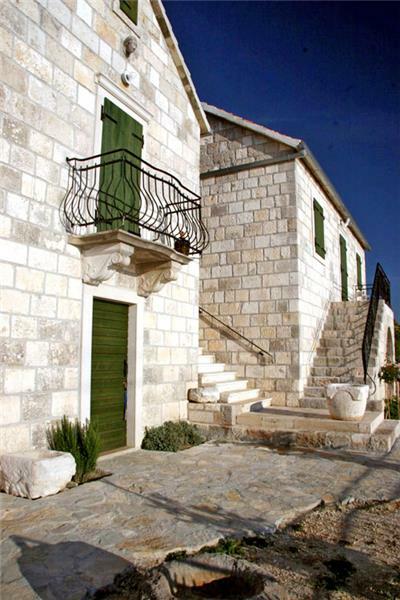 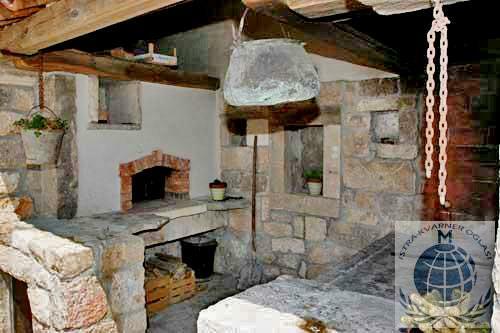 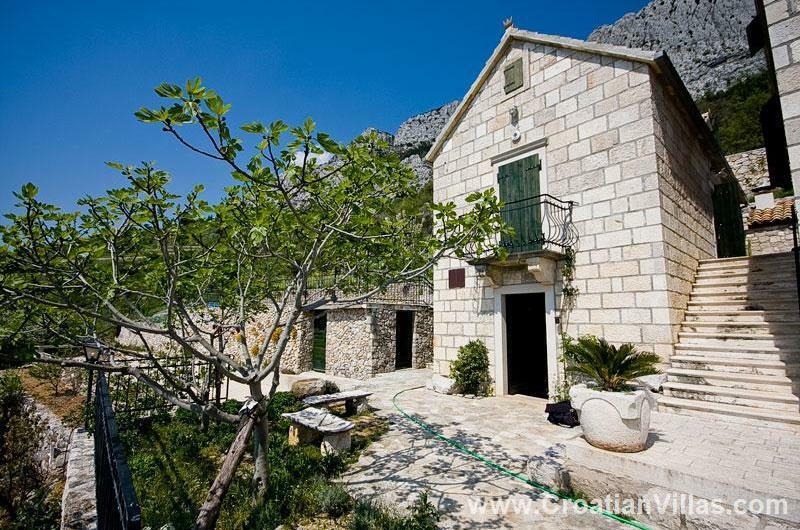 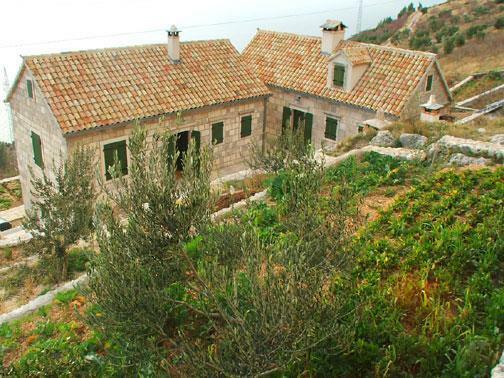 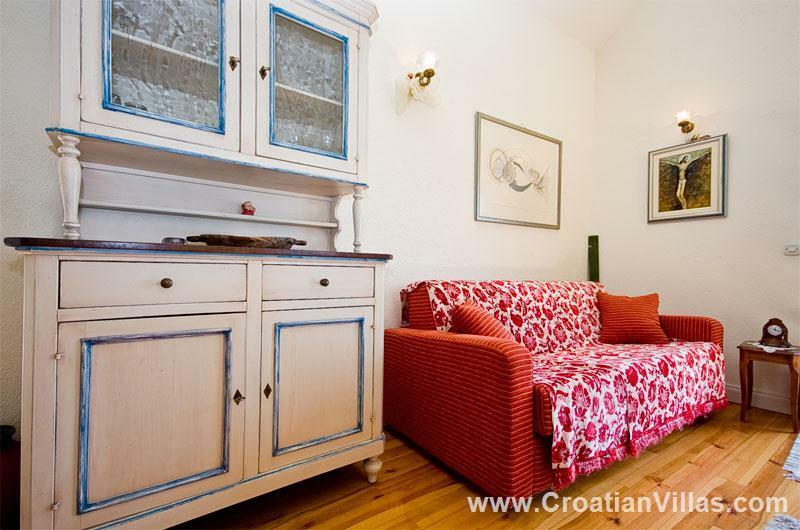 This spectacular stone villa is located above the beautiful Croatian beach resort of Brela which is well known for its wonderful 6km long white beach. 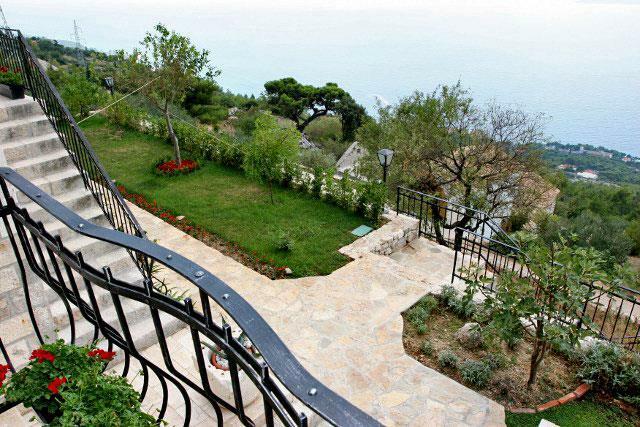 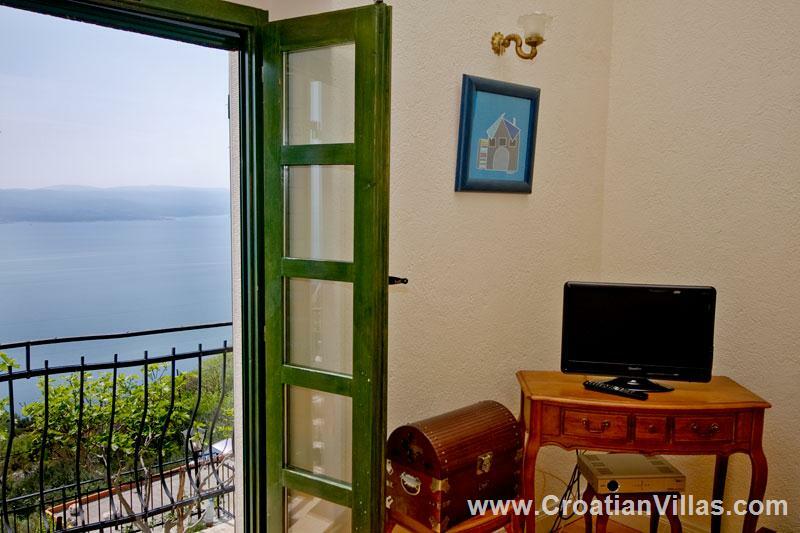 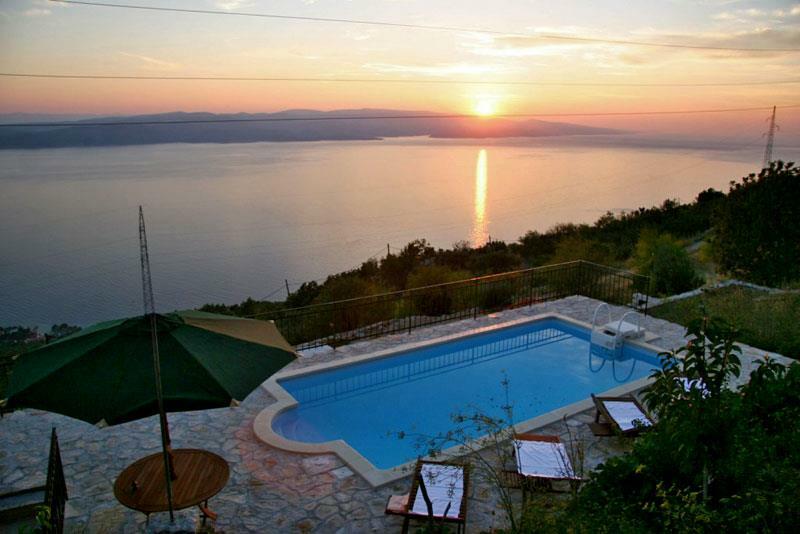 Beautifully positioned, the villa offers guests breathtaking sea views as well as incredible views of Brac island. 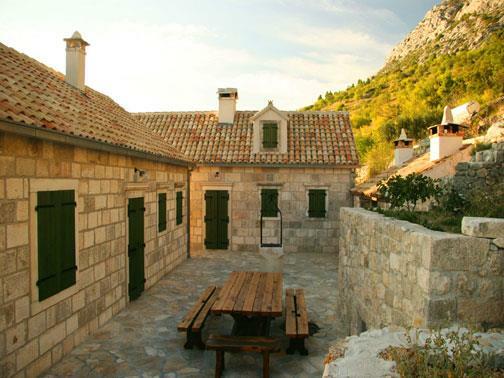 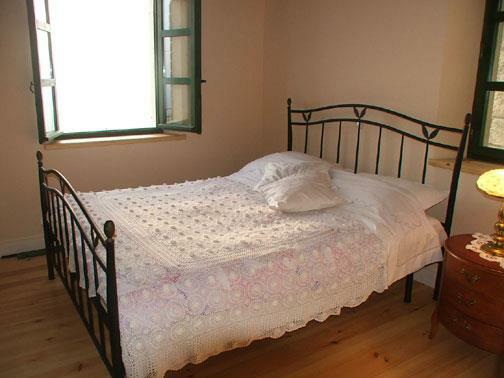 The accommodation has been lovingly restored and is presented as two stone houses sharing a central eat-in courtyard. 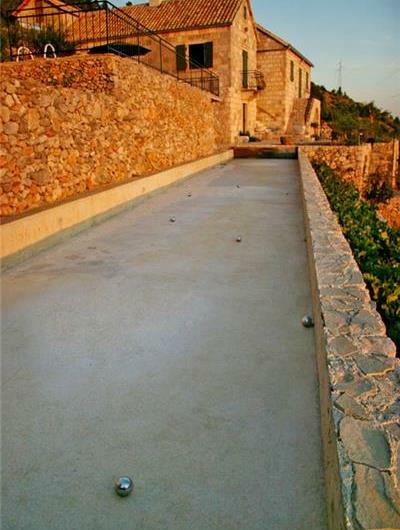 There is also a large pool and terrace area. 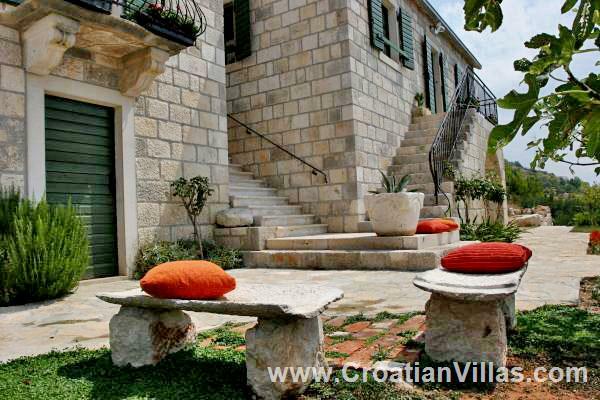 The villa is approached along a gravel road where guests enter a private driveway located by the side of the accommodation. The two stone houses are arranged in the form of an L-shape. 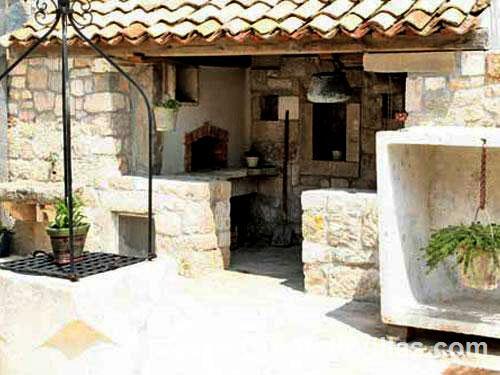 One of the stone houses features a ground floor ‘Konoba’ or indoor eating area which consists of a large central BBQ which guests can sit around. 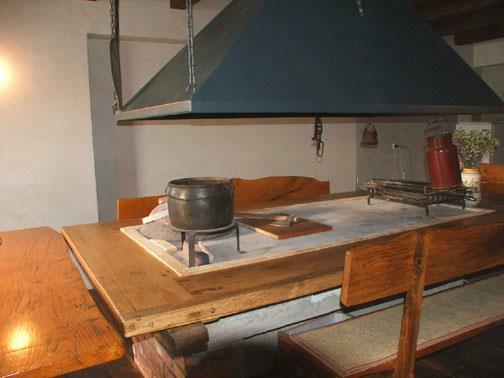 This makes for an excellent communal dining area. 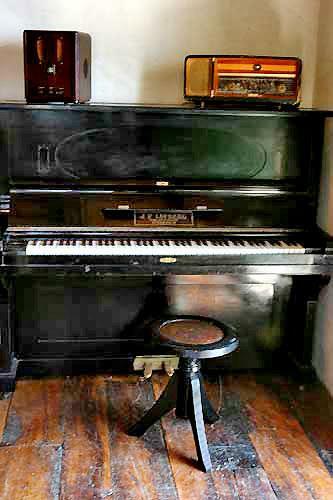 This room also features a piano for guest use. 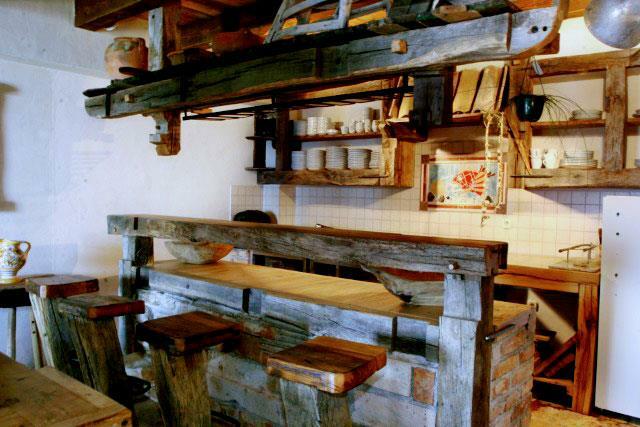 From the Konoba steps lead down to a separate ‘wine bar’ area. 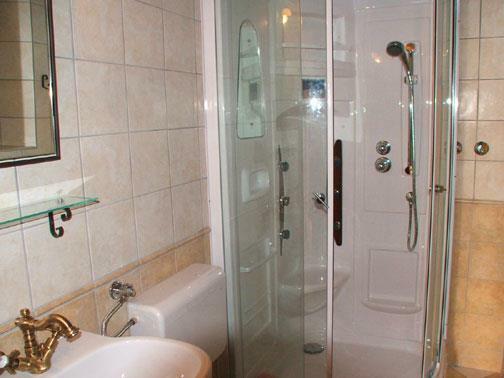 There is also a separate toilet. 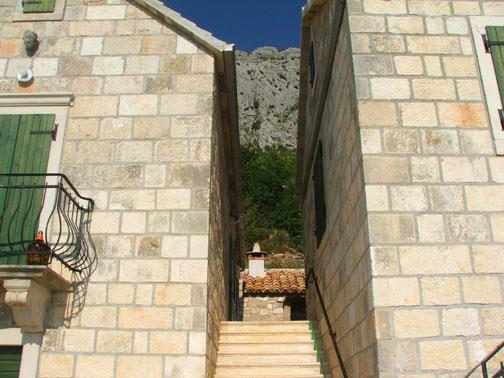 Access to the houses is up a short flight of stairs into the central courtyard from where doors to both cottages are located. 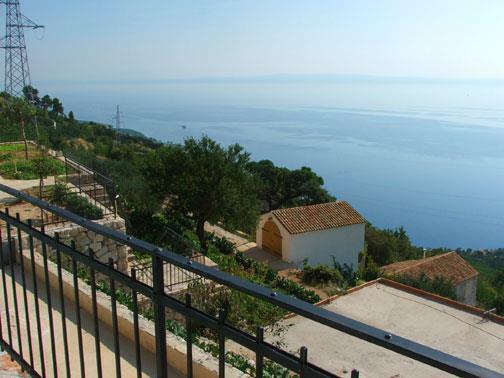 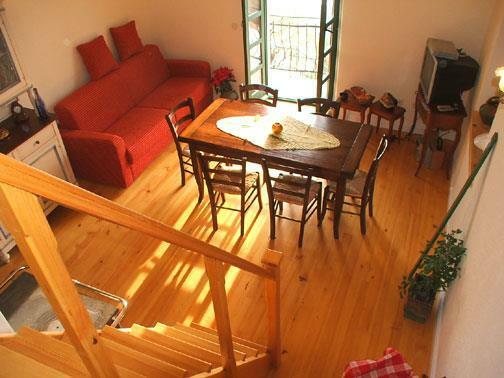 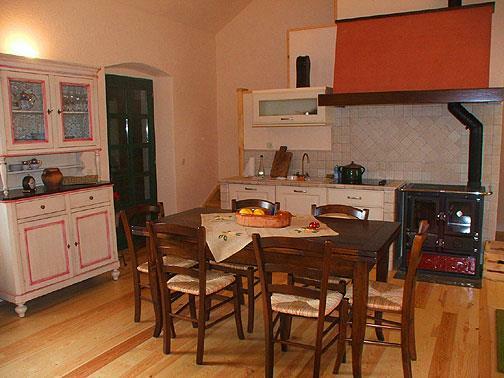 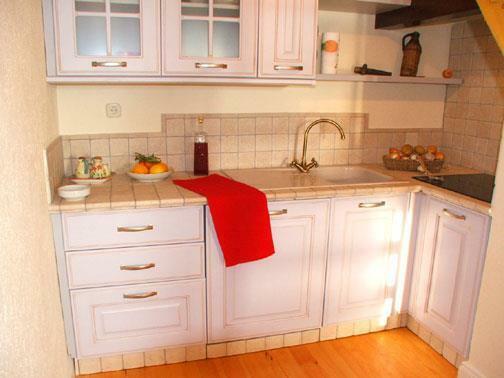 The first cottage consists of an open plan Italian kitchen/diner/lounge area with a sea view facing balcony. 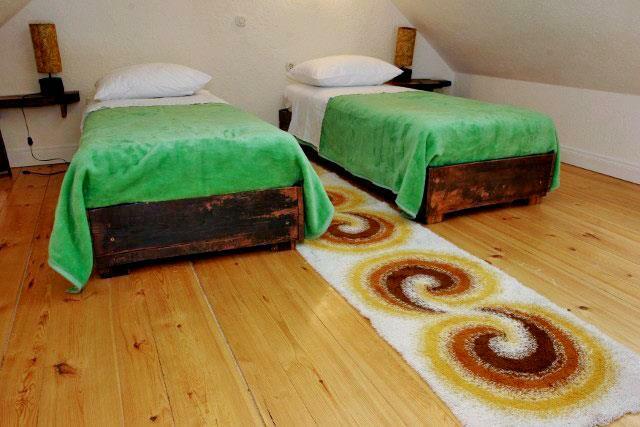 There is a separate double bedroom and shower room on this floor. 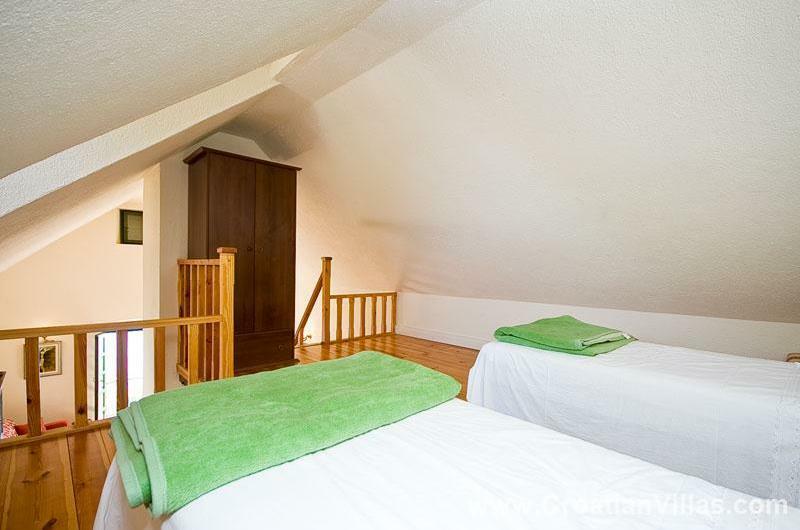 Steps from the lounge lead up to a galleried double bedroom. The second cottage is a little larger and is similarly laid out to the first cottage except the galleried sleeping area features a twin bedroom and the balcony features steps down to the ground floor. 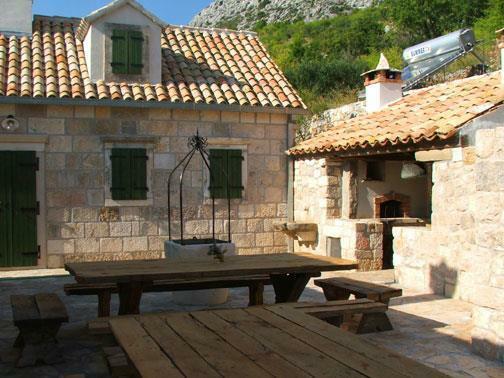 The outside courtyard, complete with ancient well, features a dining area for up to 10 persons along with an outside BBQ. 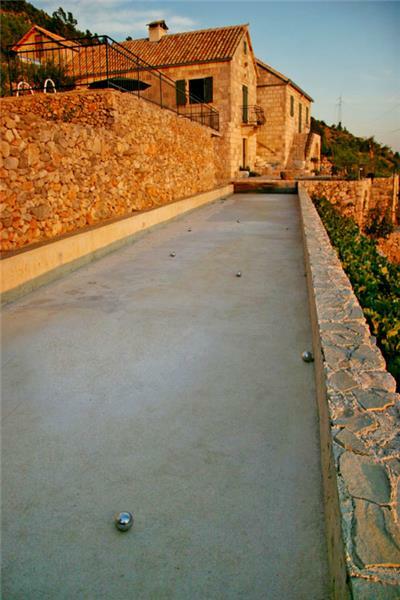 To the side of the accommodation there is a raised swimming pool and sundeck area and just below there is a boules alley. 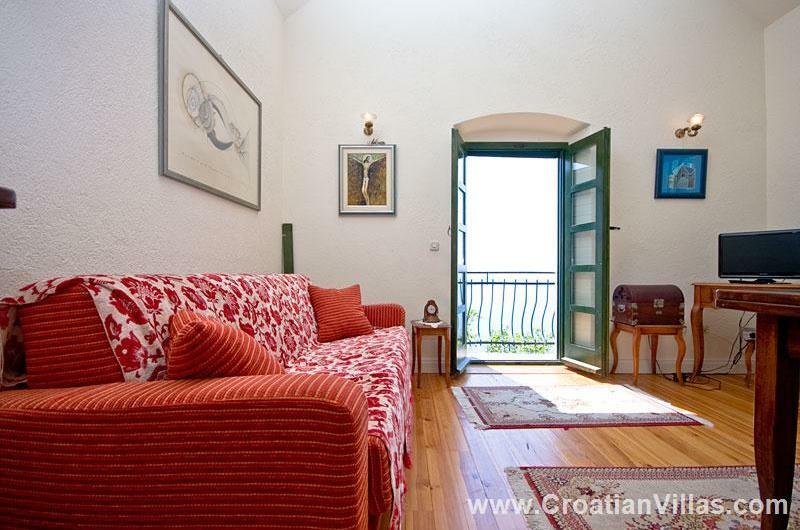 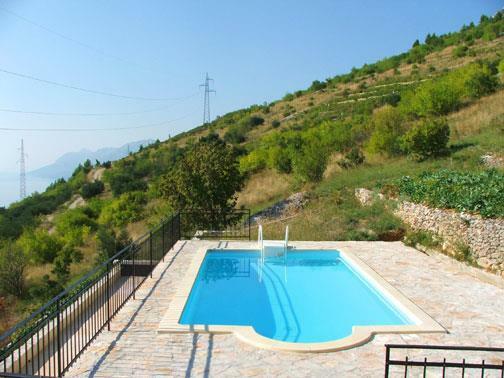 The villa would suit a family or group of friends and provides an excellent relaxing base from which to explore the surrounding region. Places to visit nearby include the town of Brela and its wonderful beach. Other activities nearby including white water rafting and canoeing on the River Cetina near Omis as well as visiting the nearby Biokovo Nature Park. 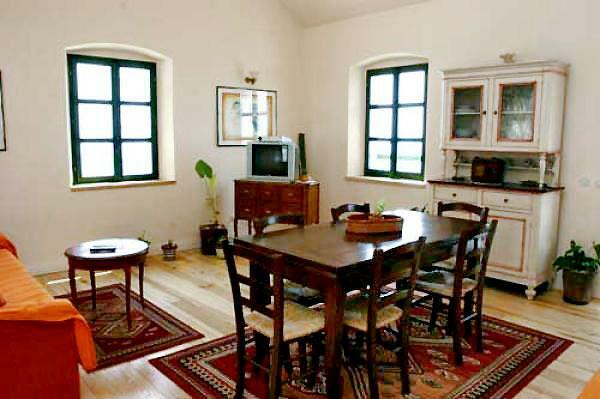 The nearest restaurant (Konoba) is located 1km away from the villa. 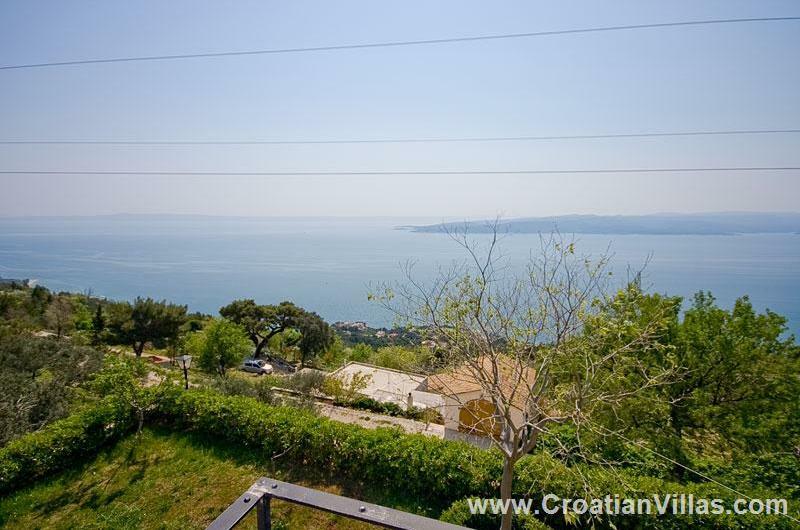 Distance to airport60km to Split airport. Details on nearest shopsSupermarket in Brela. 15 Sept. - 01 Oct.